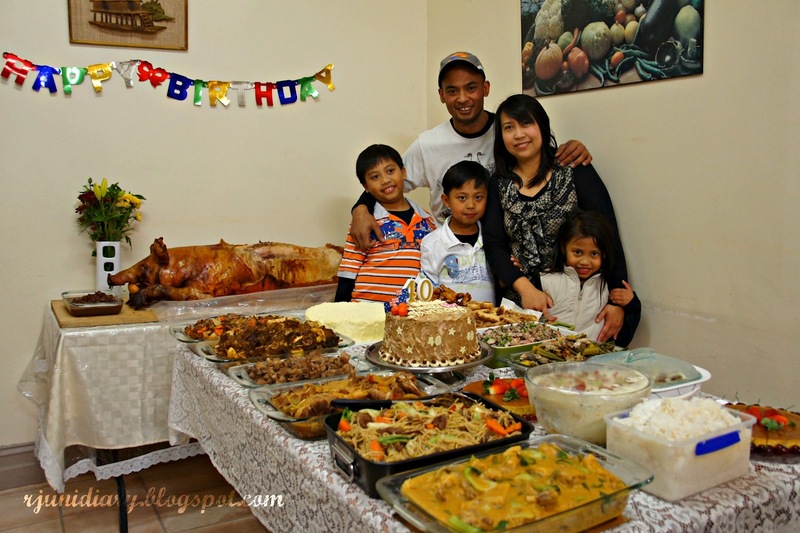 Michael is celebrating his birthday in Australia, he's a native of Batangas- a province in the Philippines that's famous for its strongly brewed coffee; he loves playing basketball and is looking after one of the biggest family piggery businesses in South Australia. My conscience is bothering me tonight. I've eaten a load of Filipino foods earlier- I never count calories but I'm sure I've taken a considerable amount of fats and sugars that could add more pounds to my already overweight physique! It's a friend's 40th birthday, and he decided to mark this day with a special party together with his friends in South Australia. Michael and his family mean a lot to me- they're my host for two weeks (1-13 July 2012) when I did my companion animal clinical placement in Balaklava (a small town approximately 80kms from my place in Roseworthy, SA). 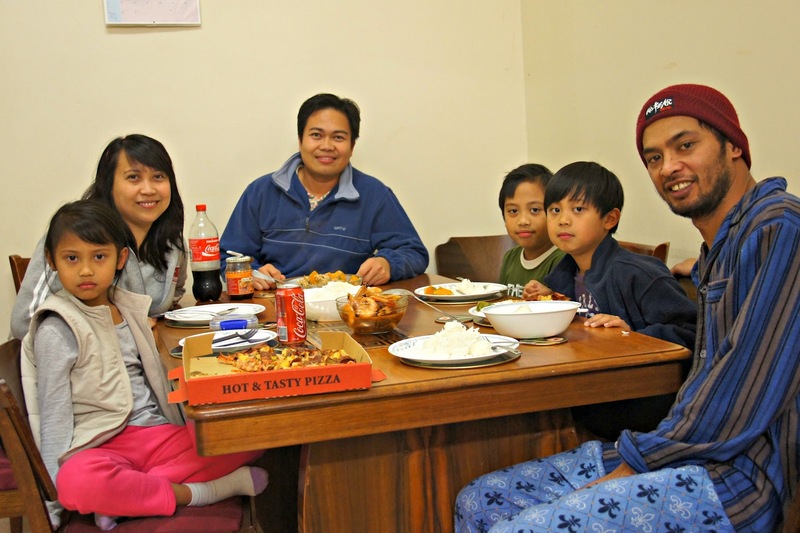 My stay with them had reminded me of our family 25 years ago in the Philippines- we're also a family of five and our youngest was also a girl. I realized how challenging it was for my parents to mold us to become a morally, legally and spiritually upright persons. I had also seen the struggles of being a parent-staying up late to fix things related to work and to the family, and getting up early in the morning (braving the wintry morning) to get ready for work in order to sustain- provide the basic needs, continue to put food on the table and finding ways to treat themselves and the kids with simple pleasures in life together. I was glad that these kids (in the photo above) had widely opened their arms to welcome me in their house- even before my arrival. BJ, Matt and Janna sacrificed, they offered their computer and playroom to be my room-away-from-room. To mention the couple's hospitality is an understatement, so better leave it... One thing's certain, I enjoyed my stay with them, and just like in the veterinary clinic, I also learned a lot from their home. I have actually started to get scared of the word 'parenting'. Before I left Balaklava a couple of weeks ago, the kids requested something, "Tito RJ can you please bake a cake for Dad's birthday?" I'd no reason to say no. A piece of cake is nothing compared to their cordial and generous reception during my stay. I sincerely said 'yes'. In the party this evening, Jhing (that's how she spells her nickname, and doesn't want to tell us her Christian name) requested me to say the prayer before the dinner. I wasn't prepared. Tsk! The organization of thoughts in that prayer was not good. Unlike the cake that I baked (and decorated) for the celebrant, that prayer didn't stand out but it was uttered straight from my heart. At the time of this writing, the party is still ongoing- a jam session with our friends who are good musicians and singers. I had to leave early because I still need to get some rest to prepare myself for tomorrow's reading and review. I have a long quiz on Clinical Pathology on Wednesday. It was a lovely night- the party guests were happy, the table was teeming and the drinks were overflowing! To have these good people and to spend time with them in functions like this are blessings. 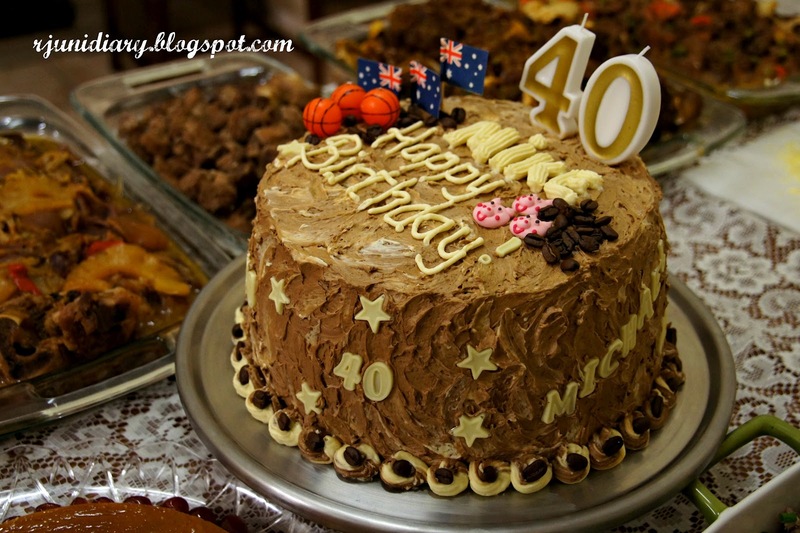 Celebrating another decade in life is a blessing, too! Michael- the birthday 'boy' with his family. Happy birthday Michael! It is comforting to know that Pinoy hospitality was not left behind when Pinoys left the old country to settle abroad. Another good thing po with this group of animal farmers (and their family) in this part of South Australia, wala pong typical na crab mentality or destructive gossiping. We've been here for more tan 4 years, so far, sooo good! It's been a long since I last read this blog. I'm just not sure if the URL back then is the still the same. I find this one unfamiliar. Anyway, I'm back to personal blogging under a new URL. I guess that's where my passion is, sharing personal stories to others. I wish I could sustain my new blog. Regarding this post, I'm glad to know that you're still in AU and you're enjoying your stay there. As usual, I'm still in doubts of going abroad for work.